Don Bosco Child Labour Mission (DBCLM), Davangere is known from its inception for its fight against the social evil of Child labour. DBCLM not only rehabilitates the child labourers but also makes every effort to prevent it at the roots. One of the measures adopted for the prevention of this social evil is the awareness programmes conducted in the villages. 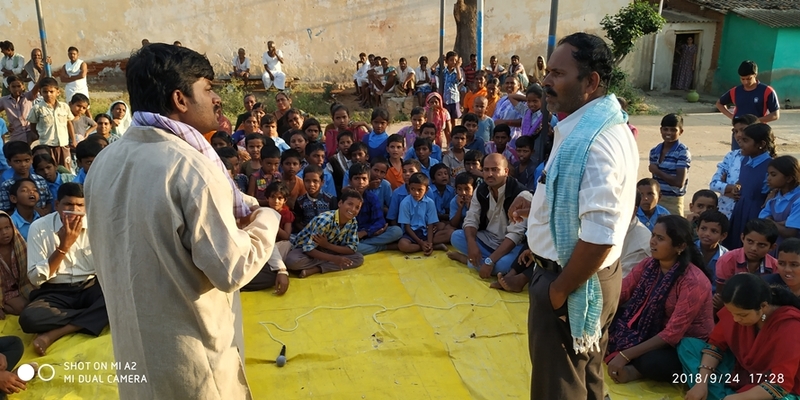 Street play is a very effective means to get this message across to the people, villagers in particular. DBCLM has a wonderful set of artists in the staff across the projects who are able to do it on the streets. The street play campaign for this year kicked off on September 24, 2018 at three different villages called Mucchinahalli, Bilichodu and Asagodu in Jagalur Taluk, Davangere. The whole story of the play revolves around a poor family of Bassayya, Gauri and their two children Siddha and Lakshmi in a village. Siddha who has a desire to study is compelled by his father to work for his landlord as he is not able to pay back the debt. Not able to withstand the mistreatment at the landlord’s house Siddha runs away and reaches in the clout of middlemen who place them at different places for money. As Siddha has run away from his house the landlord compels Bassayya to send Lakshmi now to work in his house to pay back the debt. She too meets with the same difficulty as Siddha and finds her life very hard. In the meanwhile Siddha becomes a construction worker and accidentally falls from roof and dies. The play ends where in the owner and the contractor bribe the people concerned to settle the issue and the social activists take over from there. They interact with the spectators and ask about the situation of children. Some of the villagers even expressed that even if the children desire to study, they are tend to send them to work without caring much for their future. Now they know that it is wrong and they are aware that the children lose their life if forced to work than study.